Today my husband handed me two pairs of trousers that he no longer wanted. They were both in really good condition still, so he gave them to me to either pass on to someone else or do 'whatever' with. I instantly thought of a conversation I was having in a craft group about ways to up-cycle some great old tweed coats and thus was inspired to up-cycle them... I made them each into a pair of pants for my little guy. I made them pretty much the same way as in my pajama pants post using a pair of the little guy's trousers that fit him well as a guide in cutting out the new ones. Because I like to save work where I can, I used the existing side seams in the trousers and lined up the bottom with the existing hem - it made me so happy when I came to the part where I would have normally hemmed them and it was already done!!!! Once I had cut out each side, I placed the 2 pieces right sides together and stitched up the front & back from waist to crotch, and then stitched up each leg. For the first pair I just made a casing around the waist and threaded elastic all the way through. I thought the first pair was really cute, but wanted the second pair to be a bit more polished, so I made them with a flat front and used a wide elastic in the back only. 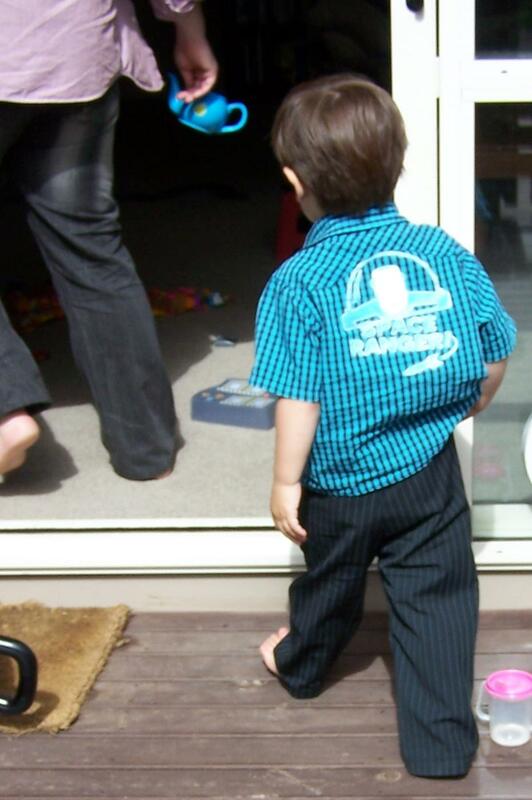 The little guy loves his new trousers and calls them his "Daddy pants". And I think they're pretty cute too.